Do you want to experience the best Flores & Labuan Bajo tour? Hello Flores team will help you create your ultimate itinerary according to your wishes, budget and interests. A trip to Flores and the nearby islands combines magnificent landscapes of nature with antique traditions that still thrives today. 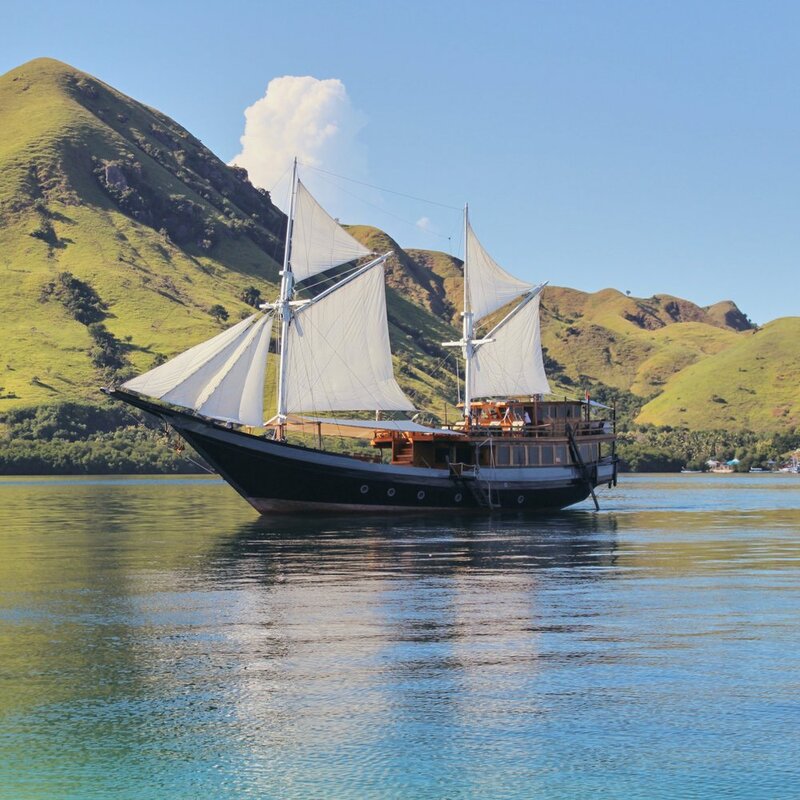 From Labuan Bajo, you can enjoy a half day up to a full week Komodo cruise to enjoy the tropical waters, pristine islands, and welcoming local people. You will find below few of our guest tailor-made journeys. These itineraries are intended as a guide to help you plan your trip in the National Park. These routes are suggestions. Feel free to create your own Flores Komodo Tour. Neither too long nor too short, 3 days of the excursion is just the sweet spot for pleasure seekers. You will have the chance to explore the pristine island, discover every main feature of Flores, yet got the opportunities to set your feet at a bunch of less touristic island. To see your travel journal hit all the iconic places and reveal new places! Isn’t it a traveler dream? Get in the ship and start your Komodo tours from Labuan Bajo. In one hour the ship will carry you to Sebayur Besar, one of the twin islands just right at the border of the Komodo National Park. The island might be unheard of, but it has wonderful natural beauty both up and below the lands. Sebayur offers a stunning view for trekking and fantastic snorkeling as you will experience snorkeling between the twin island and see the blooming life underneath. A trip to the island will not be complete without a dive or two in the ocean. That’s why you might want to include a visit to Manta Pointto swim with the giant Manta right from the deck. This shallow dive site is famous for Mantas sighting all year round. Not so long after, a group of Mantas will gracefully greet you from below, and when you have satisfied, the beautiful pink beach of Pulau Makassar awaits you to have a rest and relax. Make the most of the last day by visiting an island that you have never landed before. If the time allows, you can even fit a trek to two islands at once, before heading back to the port town. You want this day to be remembered, so why not pay a visit to a peculiar place? You can take Kalong, the bat island, to your next itinerary. The island lives up to its name, as Kalong means big bats in Indonesian. Don’t worry, these furry flyers are mostly sleepy during the day. Your captain will try to place the boat under the bats’ path, where you can stand very close to this animal and observe their natural behavior. End your journey with one last beautiful spot. Flores has abundant of amazing view, and Kelor Island can be your choice. Sits just in front of Flores hills, this small island offers hills trekking where you can enjoy a panoramic view of Flores, Rinca Island, and other islands between the blue ocean. Kelor is famous for its tranquility views, and isn’t that what you need after a long trip around Flores? Soon it will be time to dock at Labuan Bajo. When the time has come, you will be left will exhaustion ad satisfied smile on your face. For someone who always longing for a life by the sea, taking 5 days cruise is just a perfect experience. For almost a week, you will sail from island to island, hopping from beach to beach, and just relish what nature has to offer. Having a week to spare means you can explore every nook and cranny of the archipelago and have a pleasure to visit hidden spot not many people know about. Stop anywhere as you please and experience the whole beauty of these islands. Your excursion begins at Labuan Bajo, the famous port town where the ship will sail. This is your last chance to stack up your favorite snacks before being marooned for five days ahead. Meanwhile, as you have plenty of time to spend, so why don’t we use it to explore this beautiful little port town? Beside the port deck, Labuan Bajo has a lot to offer. This is a great point for your Flores exploration! Indulge in seafood delicacy at the fish market while enjoying the ocean view. Take a little trek down to Rangko Cave and swim at the ridiculously clear, secret swimming hole inside the cave. If you have much time before the scheduled time of your Komodo Flores tour, take a mini-expedition to one of Labuan Bajo’s awesome waterfalls—the Cunca Wulang and Cunca Rami, where you can enjoy swimming and canyoning before sailing off the shore. Cunca Wulang is especially gorgeous as the water streams from the canyon, entering a gorge where you can jump into the clear water and take a great shot of it. Which beach will we land first? That’s the question. With almost a week of sailing, you have the chance to check every island on the archipelago off the list. Maybe you can start your journey with a small island with captivating beauty, both in the land and below, such as Sebayur island. A great place for a starter, Sebayur is blessed with undulating hills of brownish-yellow grass, providing a pleasing contrast with the surrounding ocean. Its charming view invites you to take a short track to the hilltop, to enjoy an unobstructed ocean view and sense idyllic remoteness. If you are a licensed diver, don’t miss the chance to dive in Sebayur—diving is Sebayur’s main attraction, anyway! A number of world-renown diving sites lie just a few hundreds of meters off the shore, such as the famous Batu Bolong, Crystal Rock, and Castle Rock. The surrounding marine life is spectacular with sloping reef, coral walls, colorful sea critters, and schools of many kinds of fishes. It’s almost like a diving in clear aquarium. Past the beautiful coral plateau, the water is a heaven for pelagic hunters, turtle galore, micro diving, and occasional passing Mantas. If you wish, you can spend your first afternoon in here. The island is famous as one of the best spot in Flores to enjoy the most beautiful sunset ever. Sits on the idyllic hills and watch the sky change into pastel colors, before heading back to the cruise and prepare for tomorrow’s adventure. Passing to the neighboring Siaba Besar is highly recommended if diving is your thing. It’s one of highly popular easy dive, where you can spot pelagic, stingrays, and even dugongs. The site is also a favorite night dive among divers. You can always opt for another island to explore if you prefer to stick with land, grass, and beaches. There are more islands in Flores than what you see in the itinerary samples, such as Bidadari, Seraya, Kanawa, or Monkey island which each have its distinct beauty. The next day, another adventure awaits. Start the day with something fresh, and docking to Gili Lawa Darat is on our suggestion. n fact, the island is one of the greatest places to catch a wonderful sunrise. Take a little tracking to the hills and enjoy an almost magical scenery when the sunrise from the horizon, slowly reveals the ocean and the bumpy hills of the archipelago from the darkness of the night. During January to May, you will be greeted with lush green grass covering the rolling hills, and the grass turns crisp and yellow during the dry season—turning the island into beautiful savannah. An afternoon in the cruise clearly calls for a dip in the clear water, and it will be a great loss to miss a chance to meet the Manta. The Manta Point in Komodo National Park waters is the best place to see these intelligent creatures, as the water is rich with plankton - a delight for the Manta Rays. The Mantas are often traveling in a group and are present almost all year round. Lucky divers can even spend solid 30 minutes of interaction with the Mantas as long as the condition is right. After spending first two days with water activities, your third day of excursion should be something fun. Why not visit the famous Padar Island today? A trek to this island is one of the most essential things to do during a Flores tour package, something you don't want to miss. As the hills lack of shady trees, it’s best to take a sunrise track early in the morning while the air is still cooler. Reach the hilltop where you can catch a spectacular sunrise, and you will understand why radar Island steals thousand hearts of wanderer. Once you have finished exploring the magnificent surrounding, make your way down to Padar’s remarkable multicolor beaches, particularly the pink one. It’s time to chill. Since you are visiting the pink beach of Padar, let’s just spent the whole day indulging in the blushing beaches? Lucky you, Hello Flores can take you to another pink beach in the tip of Komodo National Park, hidden from other groups of travelers. Get into your snorkeling gear and you will see that the pink beach trails down beautifully to the sea bottom, blushing with the same hue. Sunbathing in the pink sand while watching the contrasting blue ocean truly feels like a world away from everything. Sadly, it will come the time to leave this lovely beach, and it’s time for the next journey. The fourth day of adventure will be perfect to visit the limelight of Komodo National Park, and that means the Komodo Dragons themselves! Sail to Rinca, home of the biggest lizard on earth. A visit to this daunting creature can only be compared by a thrilling stop to massive bat cave, the Kelor island. They are sleeping soundly during the day and you can watch them safely from the boat, but the real deal happens at dusk. Thousands of bats fly when the sky is turning into velvety tangerine, scattered and start preying their food in the neighboring islands. This is your last night on the cruise, and surely this will be a view you could never forget. The last day of the excursion is perfect for a sleepy pleasure before heading back to the port town. After so many adventures, having a last authentic vibe of Flores will be a foolproof closure, indeed. One last trek to the hills and you are set to grab the wonderful panoramic view of Flores, Rinca, and other islands you have visited. relax in the white sand beaches before ending your Flores Komodo tours for good. Please note that the itineraries may change at any time by the management of the boats due to among others; local condition, weather, strong current, windy and any unforeseen reason for the safety of passengers and the boat crew. Labuan Bajo trip is what a dream made of. Hop the Komodo Liveaboard and spend the day sunbathing on the deck. A little while after boarding and leaving from Labuan Bajo, you will be surrounded with clear blue ocean that stretched to the horizon. The boat is sailing in steady speed, and it feels like you have all the time in the world. Watch when the rugged green hills or the brown crisp savannah rises from the ocean, signaling your next visit. The archipelago is just what you want from island escape; dense jungle thickly covered the slope and drops to the blue ocean, only to get separated by a line of palm trees, soft sands beaches, and rocky reefs. In the West Flores, three big islands and several surrounding small islands make up the Komodo National Park, each have something unique to behold. A journey to Flores will never be complete without a sightseeing tour to these islands, and the only way to get there is by boat. A Komodo Flores tour will take you to explore the whole Flores and Komodo National Park. The exotic Flores is surrounded by equally beautiful islands, and one of the best ways to get a taste of them is by hopping on open trip from Labuan Bajo by cruise. Most of the population settle in Maumere, the largest town, and in Labuan Bajo, the port town. Other dwell on the smaller cities in Flores or cluttered at small villages deep behind the hills, leaving the nearby islands mostly inhabited and stay virgin. Your choice is endless. Hello Flores believes that there is no perfect Labuan Bajo tour package. With Hello Flores, the itinerary follows your preference. You can freely pick up any islands that spark your interest and arrange the excursion that will really suits you. When there are lots of beautiful islands that has been enlisted to your traveling bucket list, feel free to take a two to five days Flores tour package as long as your time and budget allow. Every trip begins and ends at the main port town of Flores, Labuan Bajo. It’s a 10 minutes car ride from Komodo Airport. Sail shortly after landing or spend a night first at the town, the choice is yours. Labuan Bajo is slowly brimming with shops, accommodation, and Western-style restaurants among other places in Flores, so it will be wise to stock up your needs and arrange your stay while you are still in town. Only few hotels make their online presence, so if you want to take a day rest after the excursion, it’s best to book prior to your cruise departure.